BANDO 737-18-30 Scooter CVT Belt. OEM Premium CVT Belt for 23100-GFM-901. Home > Scooter, Golf, and Karting Belts > Bando 737-18-30 Scooter CVT Belt. OEM 23100-GFM-901. 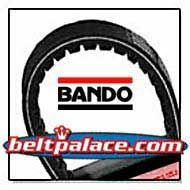 Bando 737-18-30 Scooter CVT Belt. OEM 23100-GFM-901. 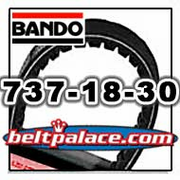 Bando 737-18-30 Scooter CVT Belt. Spec: 737x18x30. OEM High Mileage CVT Belt for 23100-GFM-901. OEM SPEC: 2010 HONDA ELITE 110 (NHX-110) and HONDA Part# 23100-GFM-901 (DBHOGFMB). MFR Spec: 737.5mm L OC x 18.3mm W x 30 degree. Kymco AC and LC scooters with horizontal 4-stroke cylinder, Kymco and SYM (Sanyang) 2-stroke horizontal engines. Part#’s 23100KEB7900, 23100-KEB7-C00, U-1B01T5201.